It's been a long time since we've talked. And, girl, you and I had some good talks, didn't we? Just thought I'd drop a few lines to let you know what's going on with the kids. They are growing like weeds! Caitlin is as tall as me now. Can you believe it? And she has the most beautiful smile. When she smiles, her eyes twinkle as if she has a secret and she knows you want to know what it is, but she ain't telling. Everyone says she looks like me, but she definitely has your smile. She plays basketball now. Like you. She tries out for the school team in several weeks. And God help her competition 'cause she wants this really bad. She's determined to make the team. So say a little prayer for her. And Ryan. Blond and blue-eyed. You'd hardly recognize him because he's grown so much since you last saw him. Even though I have some blondies on my side of the family, I gotta think that his blond hair mainly comes from your Norwegian ancestors. Don't you think? He's playing basketball for a competitive league, but he hurt his knee a couple of weeks ago. Thankfully it was just a severely bruised knee. Should be back for the playoffs. So, say a little prayer for him, too. We'll be desperately missing you during the holidays this year. As we always do. They're just not the same without you. But you're never far from our thoughts. And with your beautiful photo on the mantle, it's almost like you're here. Almost. Oh, you'll like this. The other day Caitlin said she was changing her favorite color from green to purple. "Like Grandma," she said. Of course, you know how teenage girls are. By next week, she'll have probably changed her mind at least 3 times. Oh well. That's a girl's prerogative, right? Speaking of colors, Caitlin has a pep rally today at school, and the theme is "Pink Out" for Breast Cancer Awareness. Needless to say, everyone is wearing pink. And she wanted me to decorate a t-shirt for her. How could I resist? 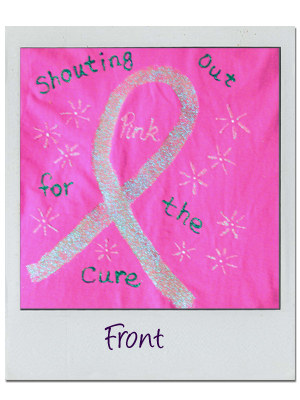 It's hot pink, and on the front is a big glittery silver ribbon, and it reads, "Shouting out PINK for the cure." And, of course, I added pink glitter to the letters. 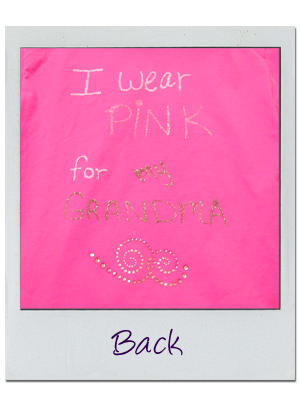 On the back it reads, "I wear PINK for my Grandma" with the "my Grandma" in purple. [Of course.] And more pink glitter. [Dang glitter. It's in my hair, on my hands, on my face, and God only knows where else. It's probably the reason my eyes are watering as I write.] Anyway, I think you'd like it. It's flashy. Just the way ya' like it. Caitlin loved it too, and she was really excited about wearing it this morning. It doesn't seem like 11 years have gone by since we last saw you. But don't ever think you're far from our thoughts. Because you're always there. In everything we do, you're there, Linda. And while I'd rather have you here physically [What can I say? I'm greedy like that. ], I'll take what I can get. Well, I guess I'll close for now. Just wanted to give you a "grandkids update." P.S. Here's some pics of the shirt. The silver and pink glitter turned to gold because of the lighting, but I think you can get an idea of what it looks like. Linda, my mother-in-law, valiantly fought breast cancer, and I've written about her here previously. 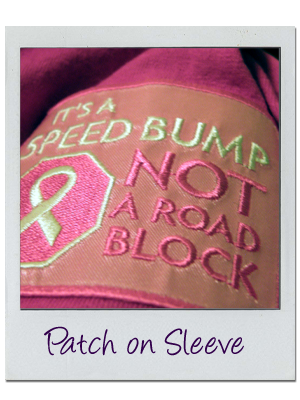 At the top of my sidebar up above, is a button/link from the Breast Cancer Site. With every click, a sponsor donates, and 100% of the donation goes to helping women afford mammograms. And the only thing you have to do is click it. That's it. So, click it. Great post Caroline. 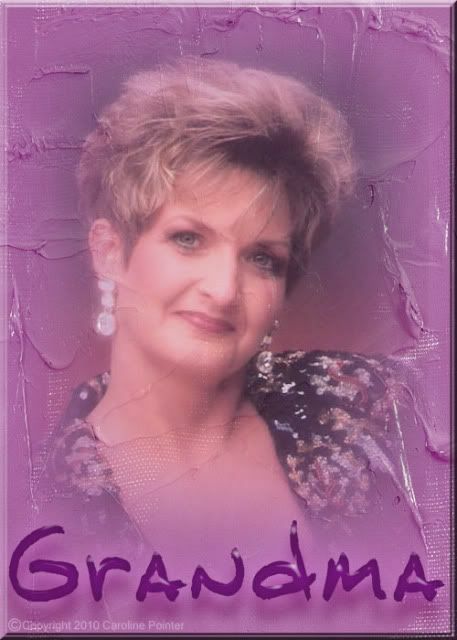 We always think of Linda this time of year and especially at Race for the Cure. Another amazing year...over 60K. Very sorry for your loss, Caroline. Oh, and I'll be scheduling my mammogram first thing on Monday morning. This is such a beautiful letter. I lost my dad to pancreatic cancer so I know how devastating this disease is. We all must keep fighting to find a cure.